Research by Rice University Earth scientists suggests that virtually all of Earth's life-giving carbon could have come from a collision about 4.4 billion years ago between Earth and an embryonic planet similar to Mercury. In a new study this week in Nature Geoscience, Rice petrologist Rajdeep Dasgupta and colleagues offer a new answer to a long-debated geological question: How did carbon-based life develop on Earth, given that most of the planet's carbon should have either boiled away in the planet's earliest days or become locked in Earth's core? "The challenge is to explain the origin of the volatile elements like carbon that remain outside the core in the mantle portion of our planet," said Dasgupta, who co-authored the study with lead author and Rice postdoctoral researcher Yuan Li, Rice research scientist Kyusei Tsuno and Woods Hole Oceanographic Institute colleagues Brian Monteleone and Nobumichi Shimizu. 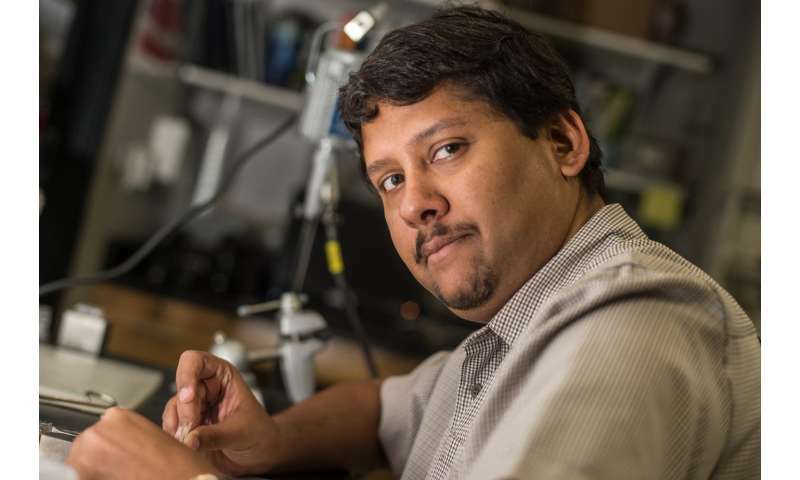 Dasgupta's lab specializes in recreating the high-pressure and high-temperature conditions that exist deep inside Earth and other rocky planets. His team squeezes rocks in hydraulic presses that can simulate conditions about 250 miles below Earth's surface or at the core-mantle boundary of smaller planets like Mercury. Earth's core, which is mostly iron, makes up about one-third of the planet's mass. Earth's silicate mantle accounts for the other two-thirds and extends more than 1,500 miles below Earth's surface. Earth's crust and atmosphere are so thin that they account for less than 1 percent of the planet's mass. The mantle, atmosphere and crust constantly exchange elements, including the volatile elements needed for life. If Earth's initial allotment of carbon boiled away into space or got stuck in the core, where did the carbon in the mantle and biosphere come from? "One popular idea has been that volatile elements like carbon, sulfur, nitrogen and hydrogen were added after Earth's core finished forming," said Li, who is now a staff scientist at Guangzhou Institute of Geochemistry, Chinese Academy of Sciences. "Any of those elements that fell to Earth in meteorites and comets more than about 100 million years after the solar system formed could have avoided the intense heat of the magma ocean that covered Earth up to that point. "The problem with that idea is that while it can account for the abundance of many of these elements, there are no known meteorites that would produce the ratio of volatile elements in the silicate portion of our planet," Li said. In late 2013, Dasgupta's team began thinking about unconventional ways to address the issue of volatiles and core composition, and they decided to conduct experiments to gauge how sulfur or silicon might alter the affinity of iron for carbon. The idea didn't come from Earth studies, but from some of Earth's planetary neighbors. "We thought we definitely needed to break away from the conventional core composition of just iron and nickel and carbon," Dasgupta recalled. "So we began exploring very sulfur-rich and silicon-rich alloys, in part because the core of Mars is thought to be sulfur-rich and the core of Mercury is thought to be relatively silicon-rich. "It was a compositional spectrum that seemed relevant, if not for our own planet, then definitely in the scheme of all the terrestrial planetary bodies that we have in our solar system," he said. The experiments revealed that carbon could be excluded from the core—and relegated to the silicate mantle—if the iron alloys in the core were rich in either silicon or sulfur. "The key data revealed how the partitioning of carbon between the metallic and silicate portions of terrestrial planets varies as a function of the variables like temperature, pressure and sulfur or silicon content," Li said. The team mapped out the relative concentrations of carbon that would arise under various levels of sulfur and silicon enrichment, and the researchers compared those concentrations to the known volatiles in Earth's silicate mantle. 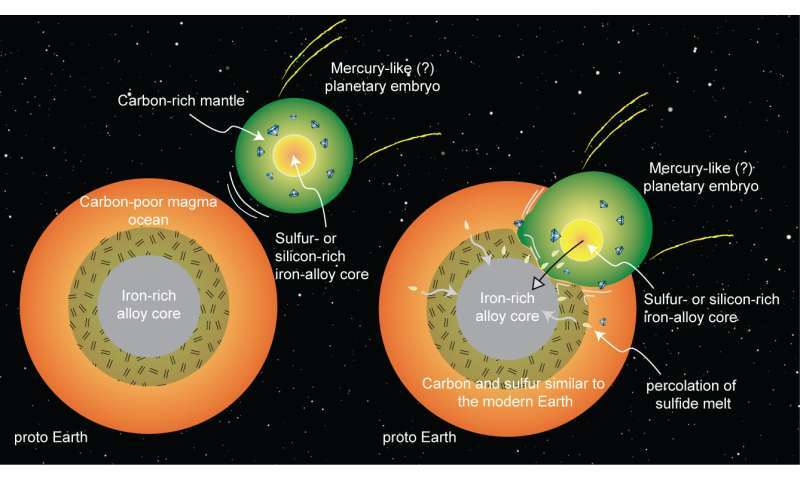 "One scenario that explains the carbon-to-sulfur ratio and carbon abundance is that an embryonic planet like Mercury, which had already formed a silicon-rich core, collided with and was absorbed by Earth," Dasgupta said. "Because it's a massive body, the dynamics could work in a way that the core of that planet would go directly to the core of our planet, and the carbon-rich mantle would mix with Earth's mantle. "In this paper, we focused on carbon and sulfur," he said. "Much more work will need to be done to reconcile all of the volatile elements, but at least in terms of the carbon-sulfur abundances and the carbon-sulfur ratio, we find this scenario could explain Earth's present carbon and sulfur budgets." "Even before this paper, we had published several studies that showed that even if carbon did not vaporize into space when the planet was largely molten, it would end up in the metallic core of our planet, because the iron-rich alloys there have a strong affinity for carbon,"
The base assumption behind this idea is what causes the problem in the first place. The researchers reject the notion of special creation and instead rely on the physically impossible accretion of dust into a planet like earth. Such an accretion would take millions of years - supposedly - and hence this problem rears its head. No such problem exists if the earth was created [out of water] and settled less than 10k years ago. Oh, and by the way, just how many freak accidents have had to occur to create the moon, mercury, etc. etc. etc.???? Well sure. Your god could have created the universe and everything in it like an enormous cartoon, and then made it look as if it took billions of years to turn out that way. He could have for instance dropped each and every photon in its proper place and sent them all on their way to make it appear as if all those galaxies out there were millions of light years away. He could after all do absolutely anything you see. But again he would be making things look other than what they were in order to deceive us. It LOOKS as if that light has been traveling for millions of years, not 10k or less. It's the same with all such evidence. And that's the whole problem. Why would your god go to such great lengths to DECEIVE us? Why would the source of all that is good and true and right be such an obvious LIAR?? And why then are we expected to trust him? Why < 10k years ago? Why not 10B years (or, actually, 13.82B+/-120M)? Or why not 1 attosecond ago and your god also created memories of the past however many years we all remember, and all of the history that goes with them? Or how many freak accidents, fossils and other miscellaneous items has your god had to create simulations and fakes of in order to make it look as if all those things really occurred and are really old? And all of it in order to make us believe something other than that they created everything - what's that about, is your god embarrassed by their creation? Surely if they are omniscient they should have seen that coming and avoided the whole mistake? Not much of a god, are they? FredJose is under the influence of a dangerous and destructive cult-- he seems so thoroughly indoctrinated he simply can't understand the overwhelming evidence that his cult have got it all wrong. Too bad the Romans weren't able to stamp it out. Do we have any guesses on how many planets in our Galaxy were formed like the Earth and a Giant collision with Mars sized object, or is Earth the only one? If we find out that many critical factors of how fast or how stable life is on the Earth all trace back to this reason, then it would make sense that the Rare Earth Hypothesis is correct and explains the Fermi Paradox. The amount of carbon, plate tectonics, the huge moon size in percentage to our Earth to help stabilize the spin and create the high/low tides and dozens of other critical factors for life. Not what if we are alone... but what if we are just a tiny bit early to the intelligent life party? If our nearest star lasts 4 trillion years and we are only at the 13.7 Billion year mark, what if life starts showing up at the 1% mark or at the 40 billion year mark and we are 26.3 billion years earlier than everyone else? Maybe you need a Mars sized collision early in your formation for life to start plus remain stable. Ok, setting aside the mythology, does this infer that there was one planetary collision to deliver carbon to the mantle then another one, soon after, resulting in the moon. Or maybe the other way around ? Is there evidence that the moon is also carbon rich ? To survive two such cataclysms seems to stretch credulity. 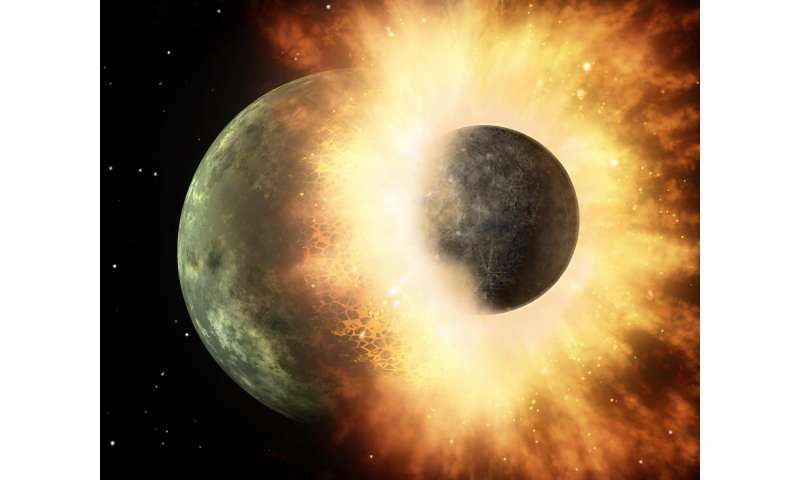 If the carbon rich protoplanet was first, why didn't the collision which produces the moon reset the mantle carbon enrichment, and, if the other way around, If the moon was formed first, remains of the protoplanet should be splattered on its surface. Seems carbon based life might be exceedingly rare in this universe. The latest research indicates a lot of low probability events need to occur for another planet like Earth to exist. Another example of scientists doing nothing but playing around 24/7. Everything they speak of as if it is proved fact are assumptions starting with what happened to the carbon the Earth first had when it formed. One glaring indicator is the notion the Earth was covered with a molten ocean early on. That assumption is rapidly falling out of favor as proof mounts that life started very early on, too early to allow for a magma ocean that would have to cool and solidify and allow the first oceans in which life arose to form. While truly good science often starts out as fanciful speculation, this is not an example of that. This is just nonsense, unprovable, and not seriously debatable. We're fortunate the denialists don't follow science closely or articles like this would give them a rich source to mine to prove their bogus assertions about science and facts. No doubt it will join Snowball Earth in the pantheon of fact free speculation passing itself off as proved science. One glaring indicator is the notion the Earth was covered with a molten ocean early on. .
Naw, I think you are swinging at ground balls with this one. This is well before the first life arose, and speaks to the very strong evidence that the proto-Earth was struck by a Mars (or Mercury) sized object about 4.3 - 4.4 billion yrs ago. That's a good 400 - 500 million years before the first evidence of life. The evidence supports both a magma ocean for the first 150 - 300 million or so years and then a colossal impact with a large proto-planet. You're getting your time lines mixed up. I have looked. I trust all the pros who have looked. I know you havent looked because I know you have a whole lot more to lose than me. Maybe, maybe not. Doesnt mean its wrong. Maybe you aren't right after all. Ever seriously consider that? Sure. But as soon as I start examining the evidence and asking questions, I run into problems. Not here and there, but throughout. That's your major blind spot. They are the first to admit that. Your priests and pundits say they don't know why their god does things but they are sure he is the one doing them. Your god gave you senses and a brain to interpret what they tell you. And then he tells you to ignore them both or you'll burn forever. Why does this make sense to you? You so desperately want to live forever that you will do absolutely anything for your god won't you? Lie cheat steal murder. Deny what your senses and your brain will tell you. Distrust anything that unbelievers say even if it makes sense. You won't do business with them. You wont let your kids play with theirs or go to the same school. And you don't want them living anywhere near you because even though they might be good and decent people, what they have to say threatens your immortal soul. And the books all say that if push comes to shove as it so often does, you must hunt them all down and kill them like any good israelite would do. And this isn't bigotry to you because it's simply a mandate from your god and he's perfect and you don't have any say in it. And so this is exactly why religion is so foul and why it threatens the world, and why it must end. Don't worry, I'm sure that if an honest decent caring god actually does exist (rather than the beast described in your book) he will look into your heart and know what you truly think and feel, and know how impossible it is to believe in this bookgod of yours because of all the lies and bigotry and murder and such, and would want you to live forever despite your failings because he knew how hard being human can be. And he certainly wouldn't torture you forever just because you got it wrong, and call it love. If we find out that many critical factors of how fast or how stable life is on the Earth all trace back to this reason, then it would make sense that the Rare Earth Hypothesis is correct and explains the Fermi Paradox. Besides the carbon the other factors such as tides and continental drift may not be crucial, and then it also depends on whether this is the only mechanism to achieve this. I'm happy to see the push-back against the religionists, but I think there's a real lack of "integrity" there, B cubed. 99% of the evil perpetrated by religion comes from Christianity, Islam and Judaism. All are descendents of Judaism. Yet, if I say that Zionists represent a pervasive, persistent threat to society's progress, all manner of howling and protestations erupt immediately. How can you have it both ways? How can you see the cancer and totally deny the source? Yet, if I say that Zionists represent a pervasive, persistent threat to society's progress, all manner of howling and protestations erupt immediately. It would be like blaming the inventor of poison gas to be the most persistent threat - even if the observation tells you that they are the ones that haven't been using it. So yeah - blaiming Zionists makes very little sense. Though one has to look at the historical context which was markedly different around the time religions became pervasive. There was no ubiquitous law/police. The only way to keep large societal structures functioning is by having these somewhat 'fair'. And that can only be done by laying down some rules. Religion is a way to make people police themselves and stick to the rules. The published article is a bit of a mess. They propose a finetuned model to predict what their own reference notes is an eminently possible outcome of Earth history. And they don't attempt to predict Venus, Moon and Mars carbon observations. [ctd] The Rare Earth idea is daft. You can choose your selection to have any likelihood between 0 and 1, so what would you test? It reflects your current opinion only. Mind that all the factors have been rejected lately, say our huge Moon is a threat later on while Venus and Mars has no tilt problem for life, et cetera. These are interesting videos that touch on organized religion . @Fred: It is *observation* that has rejected that notion, long since, exactly the formation of solar systems and accretion of planets are example. Similar attempts to remake history has also failed due to rejection by simple observations. @Jonseer: Constraints are tested with the hypotheses that use them, they aren't 'assumptions'. @Bart: Planet science is not about basic biology. Pity, since the evolution process is the best tested process science know of, due to its complexity (many details). Your claim of simple science, or even the null observation that secular atheists use, as being religion falls on its absurdity, but you can also check Wikipedia what it is all about. Since you are commenting on a science site, you better know what science is (hard work) and is not (religion, atheism. lazy trolls). Extremist Jews are as bigot, misogynist and murderous of "the Other". They are just fewer, and are not responsible for either Israel or anti-Zionism. Torbjorn- Thanks for the link to the collision Chances being much higher than I had expected or heard of before. As they continue to better understand solar system development and tools like WEBB and GMT will help confirm what at least is normal in our own nearby neighbors, I hope their computer modeling will improve to unlock the secrets to confirm how common simple life and intelligent life formation is in our Universe. I hope we do find a 2nd genisis of life formation (even if dead now) in our own solar system and I hope SETI or someone will get a signal or proof of intelligent life from our Galaxy or beyond. My gut is that we are too far away from everything else to ever have any conversations, even if we could find a real signal. My gut is that others will show up eventually with enough searching and some luck and a few billion years for our tech to improve and how/where to look. Until then, the silence is deafening. And it is exciting work! Atmospheres (volatiles) survive a Moon collision, except in a minute amount of cases. And an already dry world survive better, meaning the amount of water should tend towards that seen in Earth. Water worlds are problematic, since the amount of metals (minerals) are diluted and/or tend to be locked in by ices. Having just a few times the amount of Earth water would help. "Religion in general is exceptionally violent by nature of major bigot myths, which they refuse to change or drop by the way." On the other hand, atheists killed far more people in just the 20th century than all the religious atrocities in history. I suspect it's a result of the innate arrogance and lack of a moral center of most atheists. Lying about history is a typical religionist ploy. Hitler was a Catholic. Nazis including the SS swore an oath in the name of god. Nazi speeches and literature are full of god references. 'Gott Mit Uns' on their belt buckles - how can godders deny this? Nazism and communism were both religions, complete with messiahs sent by god, chosen people, promised lands, holy books and holy mandates. Of course if you are going to establish new state-sponsored religions you must first denigrate the old. Nazis and communists both learned this from the Jew hater Martin Luther, who learned it from constantine, etcetc. Yeah buddy. In addition to antisemitism being an integral part of the NT, we find it throughout xian history. "JUSTINIAN I°, emperor of the Eastern Roman Empire, 527–565, a virulent and consistent persecutor of all... Jews and Judaism. Justinian's famous Corpus Juris Civilis... included legislation on the Jews which confirmed or amended that of *Theodosius II (408–450) and virtually fixed the status of the Jew in Byzantine society for the next 700 years..."
"...Augustine and his followers believed that Jews "must be allowed to survive, but never to thrive" so that their public misery would broadcast their "proper punishments for their refusal to recognize the truth of the Church's claims." -and of course the pope did not forgive them for killing god until 1965. But NONE of them ever took bigotry out of the book. If one is to believe this hypothesis than the same thing had to occur with Venus with has a high carbon content atmosphere which most likely means a high carbon content in its mantle as well. Two high carbon bodies crashing into two separate planets seems a bit unlikely but not impossible. and, (3) and this is a question, is science vs religious mysticism point to a lack of scientific usderstanding? Hmm, seems that the Red Herring season has started !! !